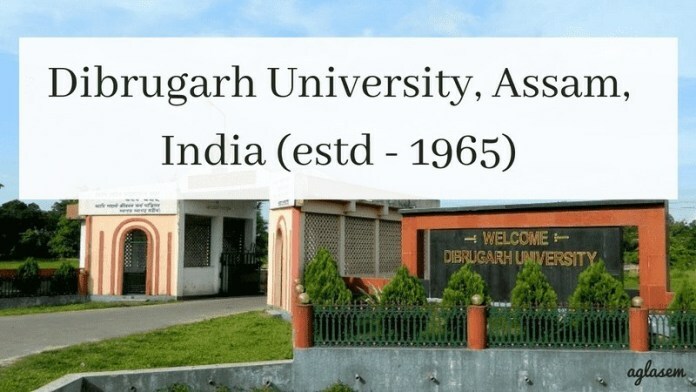 Dibrugarh University Exam Routine 2019 has been released. Students can check Dibrugarh University Time Table from this page. Dibrugarh University Date Sheet for the end semester examination to be held in May 2019. Students can check their exam date, paper code, exam time and session from Dibrugarh University Exam Routine. Dibrugarh University is conducting B.A., B.Sc, and B.Com Semester Exam from May 2019. It is important to submit the exam form and fees to appear for the university examination. Check the article for more information for Dibrugarh University Exam Routine 2019. Latest: Dibrugarh University has released the Time Tables for Programme for PGDCA 1st Semester Examination 2019 under DODL, DU. Students can use the Dibrugarh University Exam Routine 2019 for the preparation. Students can make a study timetable based on the Dibrugarh University Exam Routine and start the preparation for the annual / semester exam. Dibrugarh University Result of the semester examination can be check through the official website of Dibrugarh University. Check the table for important dates and exam routine. Time Table: Students can check Dibrugarh University Time Table at university official website, www.dibru.ac.in. How to Check Dibrugarh University Exam Routine 2019? Click on the links provided in the table and the exam routine will open in pdf format. Students can even check the official website of Dibrugarh University for the exam routine. Follow the steps and check Dibrugarh University Exam Routine. Students eligible to appear in the Dibrugarh University annual exam/semester exam have to collect the Admit Card before the exam. Students can collect the Admit Card from the university. Dibrugarh University Admit Card is required during the exam. The examiner in the exam hall will check the Admit Card issued from Dibrugarh University. Students must carry their identity card along with the Dibrugarh University Admit Card on the exam day. Any student without Admit Card cannot write the exam. The student should carry their admit card and identity card to all exam. Check Dibrugarh Admit Card page for more detailed information.